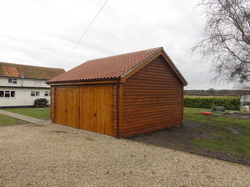 It is possible to reduce costs and overcome some planning restrictions at the same time by erecting a timber framed building instead of a modern brick or block building so if you are thinking of having a new garage or even extending your home there are a variety of finishes to choose from, for more information or to discuss your needs simply email us at mcgiverncontractors@hotmail.co.uk, or you can fill in the request a call back form at the bottom of this page, we look forward to hearing from you. We are a father & son business based in Norwich, Professional, Friendly and Reliable we provide the highest quality carpentry & joinery services covering all aspects including windows, doors, skirting & architrave, flooring, cut & truss roofs and our complete Kitchen fitting service. Providing unbeatable service if its new build a refurbish or just complimenting your home with something new we have the skills and know how to help you. We pride ourselves on providing the highest standard of workmanship possible, Friendly, Trustworthy, Quality Assured for at competitive prices, We are qualified tradesmen with over 55 years experience between us we carry up to date CSCS cards and CRB Disclosures, And are fully insured all certificates will be made available for you to inspect for your peace of mind. Contact us today for information and bookings.